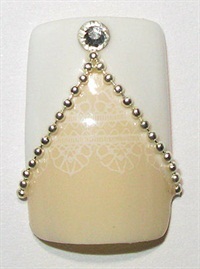 Dana Cecil of Dover, Ohio, shows how to make this wedding nail art. Dana Cecil (@dana_nailjunkie) of Dover, Ohio, shows how to make this wedding nail art. 1. Start with two coats of a buff gel-polish. Cure and remove tacky layer. 2. 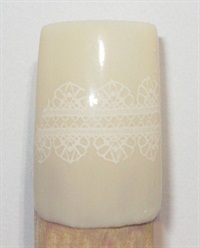 Use a stamping plate to place a lace image onto the middle of the nail with white nail polish. 3. 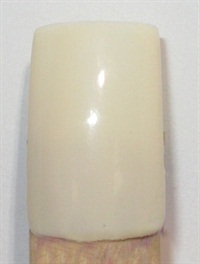 Create your angled tip using two coats of white gel-polish. Cure. Top coat once, and remove the tacky layer. 4. Cut a small silver ball chain to fit the angles. Use nail glue to place the chains. 5. Add a Swarovski crystal to the point with glue. Apply top coat around the pieces, and wipe clean. Acrylic company founded by Tammy Taylor in the 1980s.